It feels like I’ve been saying for years that “this year we should go to Oktoberfest” or “we should definitely go to Hampshire Oktoberfest this year.” This year, I’ve obviously not managed to do either, but I did get the opportunity to get involved in the festivities. I had a lot of fun this weekend. Sarah and Matt invited me along to Melbourne Oktoberfest to celebrate a friend’s birthday and meet their Australian friends, who turned out to be super cool. I expect most of my regulars have probably already seen the photo of us all kitted up, but just in case you haven’t; here it is! 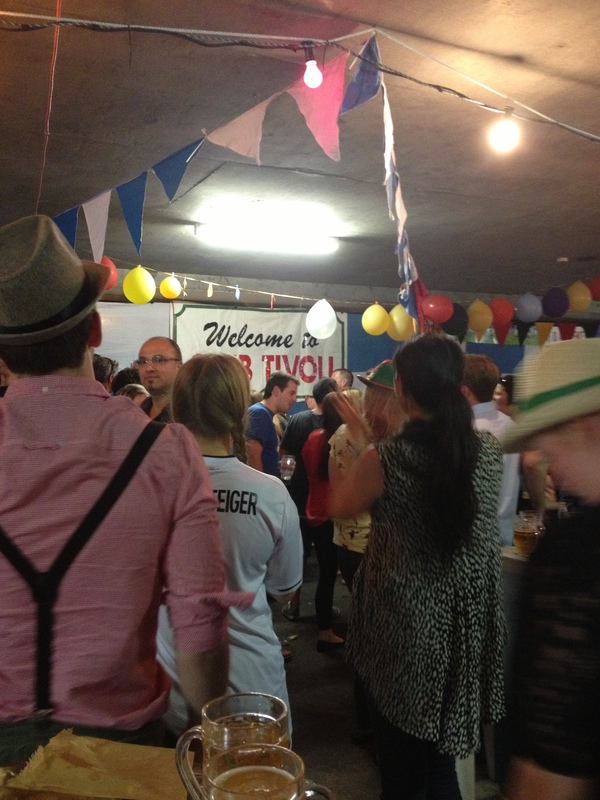 After a two hour run around the city looking for the best possible outfits we could find we headed down to the German Club Tivoli to enjoy a couple of drinks and have a bit of a good time. 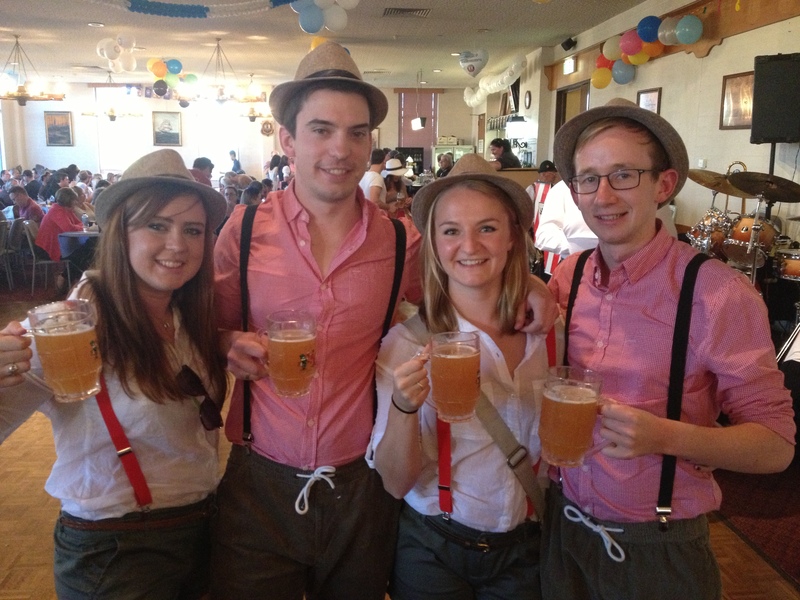 Upon arrival there was a brief panic as everybody stood outside looked like regular every day Australians, and there we were looking a bit ridiculous and very marginally German. 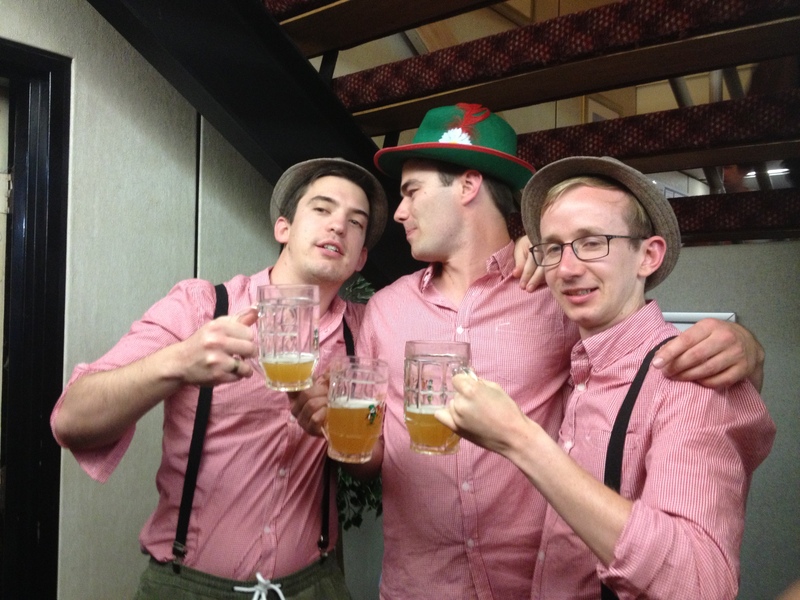 Our fears quickly disappeared once we’d made it inside and found plenty of other people looking both more ridiculous and significantly more German. It didn’t take long for the beer and then the schnapps to start flowing. I started to get to know the gang and found that there was plenty of humour to my taste. Brent, not my house mate (apparently this is a common name in Australia as I’ve met three) casually dumped a shot into Matt’s beer. After the follow up hilarity of Matt’s poor attempt to do the same to me, Pedro dropped another one, Matt ended up with the most disgusting beer going. Further moments of amusement included a guy wearing the same shirt as Matt and I, who hadn’t attended in fancy dress and being loud and raucous on the tram on our way to find something to eat where I was promptly bullied for not eating meat. It was really great to get out with a group of people and just enjoy having a bit too much to drink as I’ve not actually had all that many opportunities to that so far on this trip. Once again, I find myself ever grateful to my local friends and am loving the advantages of having friends scattered around the world.